You can use them as masks to clip pictures or give light to the layout using them with different blend modes. Four hand painted 12x12 inch overlays for blending papers or photos. Simply drop one of the overlays on top of a canvas or background paper and clip another paper or photograph to it for a painterly look. Experiment with blending modes for unique results! Created at 300 DPI for optimum print results and saved in PNG format. These overlays are semi-transparent in areas as they were created with paint. This month's Art Crush 4 features strong colours with softer tones of blue and grey. Everything you need to make your creations outstanding and memorable! A pack of 12 Textured Brushes. Use to highlight your layouts! A collection of 8 distressed, inked and grunge styled Banners in .png format designed for clip a photo or paper with the clipping mask function in PS, recoloring, use different blending modes, different opacity levels, layering to create different effects or use as a matte for one or more images. Use to highlight your layouts! A pack of 8 distressed, inked and grunge styled Banners. Use to highlight your layouts! 4 different images in 2 versions. With those colorful Magic glows and Lights you can give your layouts an extra colorful touch. Place them and try different layer settings in your graphic program. Pin light, overlay or multiply everything will create different look on your papers or images. Some will give them a lens flare tough others only a colorful overlay. Try and be artistic in your own way. A set of 30 layered photo templates (PSD) - a total of 10 designs in 3 different sizes/versions: 3x4 cards, 4x6 full photos, 4x6 half photo with space for journaling or embellishment. Each template has separate layers for the typographic stamps, your photo(s), and for varying border widths (hide and unhide layers to create your perfect print). Stamp layers can be easily recolored to match your photos or to coordinate with additional products. A second set of large, versatile masks; a great and easy way to give your pages that wow-factor you were looking for! Simply use them as a clipping mask to clip them to your photo(s) and/or papers! 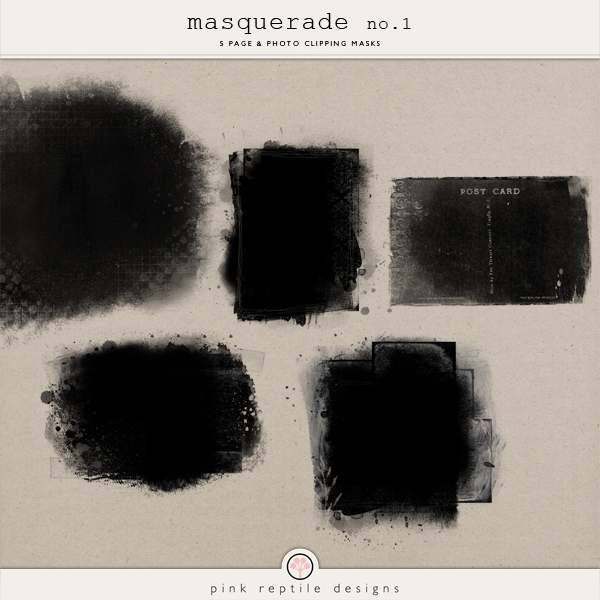 5 photo / page masks created at 300dpi. These large, versatile masks are a great and easy way to give your pages that wow-factor you were looking for! Simply use them as a clipping mask to clip them to your photo(s) and/or papers! These actions are for personal use only. Contact me at valoriewibbens@yahoo.com for professional use licenses.